Designing properly your sensory discrimination test is an important step in the procedure. Do it directly in Excel using the XLSTAT statistical software. Designing an experiment is a fundamental step for anyone who wants to ensure that data collected will be statistically usable in the best possible way. No use to evaluate products from a panel of assessors if the products cannot be compared under statistically reliable conditions. It is also not necessary to have each assessor evaluate all products to compare products between them. 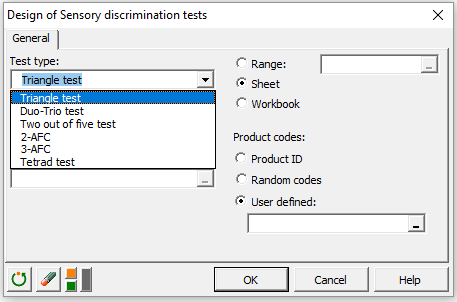 This tool is designed to provide specialists in sensory analysis to provide a simple and powerful tool to prepare a sensory discrimination test where assessors (experts and/or consumers) evaluate a set of samples. When new products are setup in sensory analysis, discrimination tests are very important. XLSTAT allows you to generate combination of products to be presented to your assessors so that they are in the correct settings for that kind of test. Sensory discrimination test are based on comparing two products that are presented in a specific setting. When creating your design, you have to know which test you want to apply, the number of assessors and, if possible, the number of assessors. You can specify more than one session and add labels to the assessors and products.